A series of larger, tableaux style paintings that construct narratives portraying humans in a dystopian Anthropocene. Engulfed by the claustrophobic mesh created by modern network technology, the characters in the works appear vacant and at odds with the technology around them. 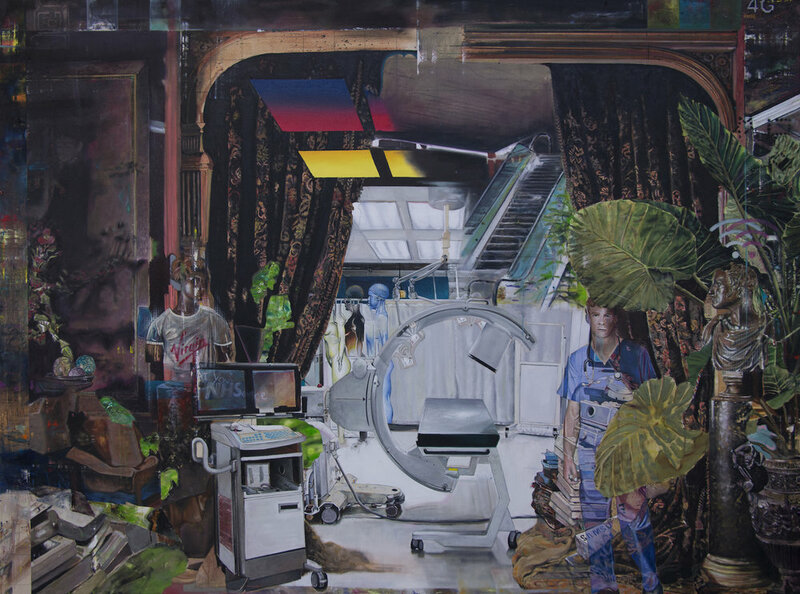 The paintings blend the high-tech/lowlife dualism borrowed from cyberpunk film and literature with reference to real life socio-political and environmental issues in the present. Through constructing the works to a very physical and tactile medium such as paint, the works also reference another dialectic between virtual and physical. We often imagine the internet and networked technologies as a giant invisible force field with masses of data stored in real clouds of vapor in the sky. The opposite is in fact true; clouds are data centres in anonymous looking warehouses with football field sized rows of computers, processors and fibre optic cable. According to the Asia-Pacific Economic Cooperation forum, 97 per cent of all intercontinental data is carried via such cables. Additionally, the maps these cables draw beneath the sea trace old colonial routes. Virtual and Physical is inseparable today, neither can exist without the other. Consequently, the entanglement an object like the internet has with human experience in the past present and future elevates it to what Tim Morton coined as a Hyper object. This is a thing that encases, envelops and entangles us, but that is literally too big to see in its entirety. Mostly, we perceive hyper objects through their influence on other things – a melting ice sheet, a dying sea or the destruction of coral and algae. The term can be applied also to things like black holes, dark matter or evolution. Morton mostly uses the term when discussing global warming. We may perceive hyper objects as personal because they affect us directly or imagine them as the products of scientific theory but in fact, they stand outside our perception and our measurement. They defy our ability to describe them rationally, and to master or overcome them in any traditional sense. The internet can be understood under this hypothesis in the sense that since its inception through to its shift into a more networked web 2.0 because it has affected the way we do almost everything. A sizeable proportion of this ‘everything’ is online shopping. This often includes buying more electronic items, which in an increasingly shorter time, become obsolete and on a trash pile. This is made reference to in the paintings by the use of popular tech brands and popular ‘Hypebeast’ clothing brands like Supreme. In ‘The Rat Race’ (2018) Amazon and Deliveroo workers are seen darting around ensuring speedy delivery and in ‘Interface’ (2017) characters are seen immersed in VR using the latest consoles. Electronic waste, as well as forming the title for the series, appears in the works as a metonym for the consequences of increased planned obsolescence in electrical products which is increasingly playing its part in real life reaching the fictional dystopian setting for the works. Disposal of e-waste is an emerging global environmental and public health issue, as this waste has become the most rapidly growing segment of the formal municipal waste stream in the world. Ghana, India and China are amongst the worst affected, with low paid workers enduring fierce heat and poisonous chemicals to rummage for precious metals amongst the computer hardware to sell for a profit. Despite strict guidelines in place in developed countries, a large proportion of old computers and electronic goods with dangerous component metal parts are smuggled to the less developed world where the poisonous fallout from its commodification as waste effects the environment. Ash lead and cadmium enters the ecosystem leading to blood poisoning and drastically lowered life expectancy.